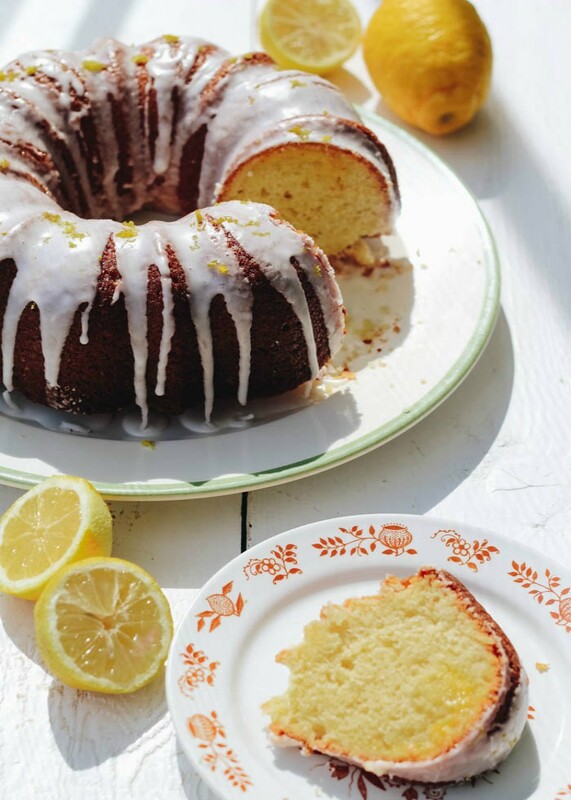 This Lemon Bundt Cake with Lemon Curd Filling is sure to brighten any party or special event! It is bursting with lemon flavor from the lemon zest, homemade lemon curd and fresh lemon glaze. Are you getting hit with a bomb cyclone or with a heat wave? 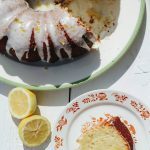 Whatever your weather situation, SPRING is here and this Lemon Bundt Cake with Lemon Curd Filling spells sunshine and happiness! It makes my people smile when I make it. Heck, it makes me absolutely GIDDY! Yes, I said giddy. I happened to make an angel food cake recently and was stuck with a a dozen egg yolks. So what I normally do is make lemon curd and use it for different things. My people were requesting a lemon glazed cake so it became a lemon cake with lemon curd filling kind of a day!! I have some exciting news!! What do you think of the editing of these photos? I hope you love them! If you do…you could buy them for yourself in our new listing on Etsy!! You’ll find our Foodblogger Desktop Preset and also the Mobile Lightroom Preset for Foodbloggers. The colors are gorgeous and will make your food blog photos pop and say HELLO to fabulous Instagram photos!! Thank you for supporting our Etsy shop! There will be more presets to come!! I used to be quite the Bundt baking fanatic. I even started a monthly Bundt baking group called #BundtaMonth. Every month we offered a Bundt baking theme and everyone around the world joined in with their delectable Bundts. 100’s of Bundts were made those years we were all baking together. I will be continueing the #BundtaMonth project in 2019 and each month share here a different Bundt cake with all of you. This is my April addition and I hope you love it as much as we did!! If you don’t have lemon curd on hand or even care to make your own, you could totally leave it out. 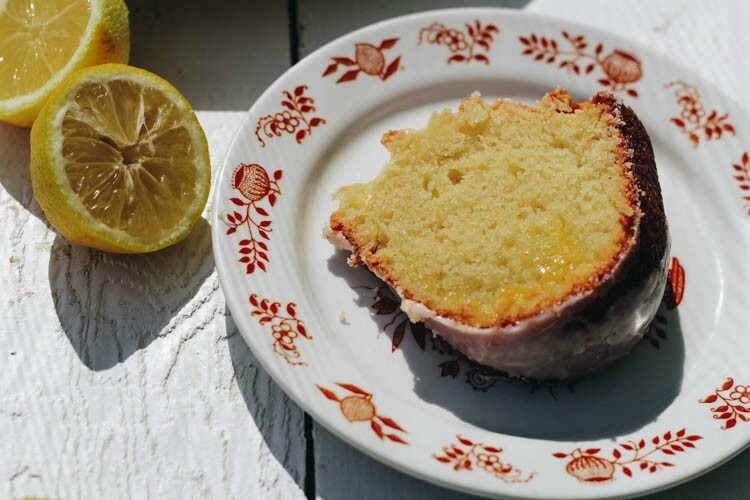 The cake is all about the LEMONS and it is truly wonderful. So nonna (my mom, not my mother-in-law nonna) was here on the day I made this cake and let me tell you something. To be completely honest, she is never, and I mean NEVER, happy with my glazes. They are never thick enough. So I gave her my confectioner’s sugar, and of course, I was almost running out of it. She swore it would be enough to glaze this beauty. And go figure, halfway while she was glazing it on, it ran out. I’m not kidding!! But she wanted me to show you guys this photo below. This…this is how thick it should be. And this is for my reference mostly and anyone else that needs a little reminder on how to make the glaze should look. I should have done a video so that will be our next project here. Perhaps the best part is the homemade lemon curd. If you can’t find the time or patience to make your own, feel free to buy a nice quality lemon curd. Before glazing the cake, I do brush it with sugar mixed with lemon juice, which makes this nice crunchy lemon topping. After glazing it I did sprinkle a little of the lemon zest on top (it’s so pretty!). The homemade lemon curd in the cake batter and also as a filling makes this cake my favorite lemon cake to date!! Do you have a baby shower coming up or even an intimate bridal shower? Make this gorgeous cake! 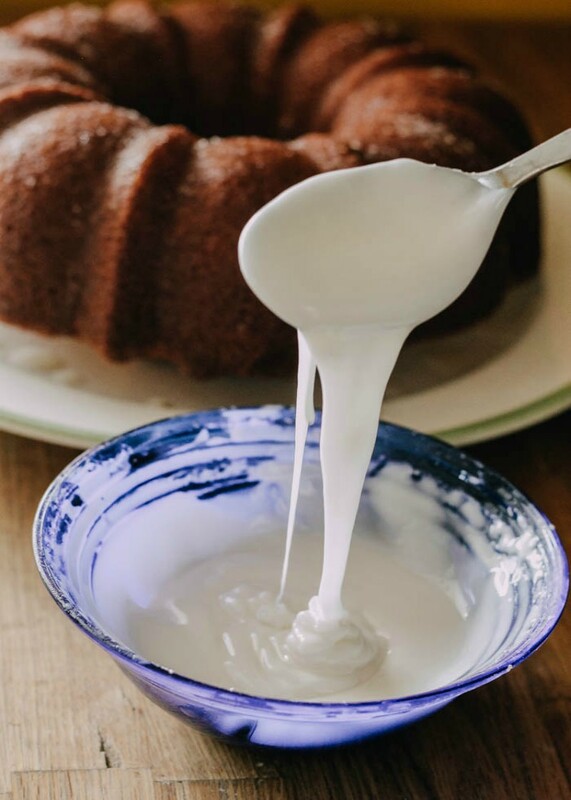 My favorite Bundt cake recipe and the lemon curd I always make! 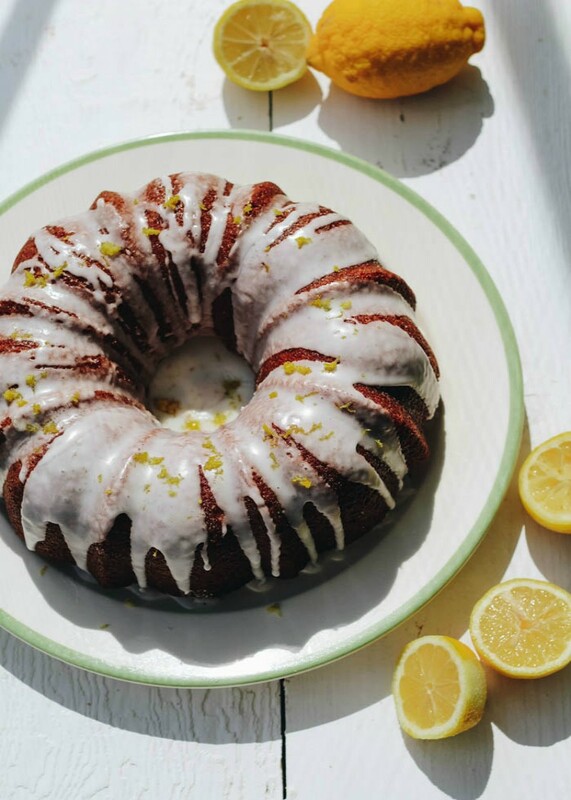 This lemon Bundt cake with glaze is sure to brighten any party or special event! It is bursting with lemon flavor from the lemon zest, homemade lemon curd and fresh lemon glaze. If you are making your own lemon curd, prep the curd the a few hours (or night)before so will be completely cool. Whisk together in a medium sized sauce pan the sugar, zest, and egg yolks; whisk in lemon juice and salt. Place the pan over medium heat and add in the vegan butter sticks (or butter). Stir until the butter has melted. Keep stirring until the curd is thick enough to coat back of a wooden spoon. Take care not to boil and to whisk very quickly; 5-7 minutes. Spoon out the curd over a fine-mesh sieve into a glass bowl. Be sure to spoon it out a small portion at a time into the sieve. Place plastic wrap over the surface of the curd and refrigerate for 2-3 hours or overnight. In large bowl, whisk together the flour, baking powder, baking soda, and salt; set aside. In the bowl of your stand mixer, cream butter and 1 1/2 cups sugar until pale and fluffy using the paddle attachment (you could also beat it with a hand mixer), 4-5 minutes. Beat in the eggs one by one, waiting until each has been incorporated to add the next. Be sure to scrape the mixing bowl after each addition of the eggs. Add the vanilla and mix to combine. Add in the lemon zest and lemon curd and mix well. Add half of the flour mixture to the mixer beat on low speed until incorporated. Scrape down the sides of the bowl to incorporate. Add in the lemon zest, 1/4 cup lemon curd and almond milk (or buttermilk)and beat until incorporated followed by the remaining flour mixture; scrape the sides of the bowl to incorporate. Spoon half of the cake batter into the Bundt pan; spread evenly with a spatula. Spoon the 1/4 cup remaining lemon curd around the batter (make sure not to touch the edge pan). Spread on the rest of the batter evenly with a spatula. Tap the pan heavily on the counter a few times to help even out the batter and remove air pockets. 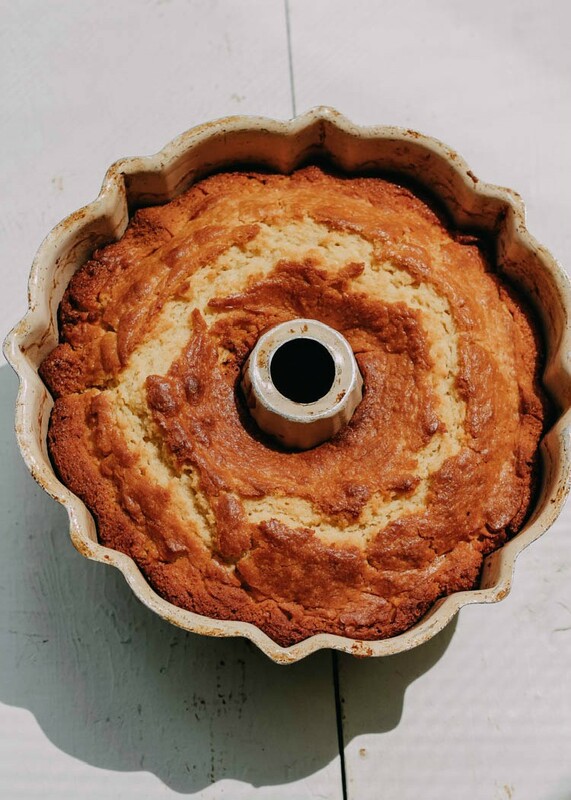 Bake for 45-50 minutes, or until a toothpick inserted into the center of the cake comes out clean and the top springs back when lightly pressed. Before I glazed the cake, I mixed two tablespoons sugar and some lemon juice in a small bowl. I brushed that on the cake and let it sink in. In another small bowl combine the confectioners’ sugar with lemon juice. Add more juice (or water) if too thick or more confectioner’s sugar to make it to your liking. What an absolutely gorgeous gorgeous cake!!! Anything with lemon curd inside has my vote! Gorgeous cake! 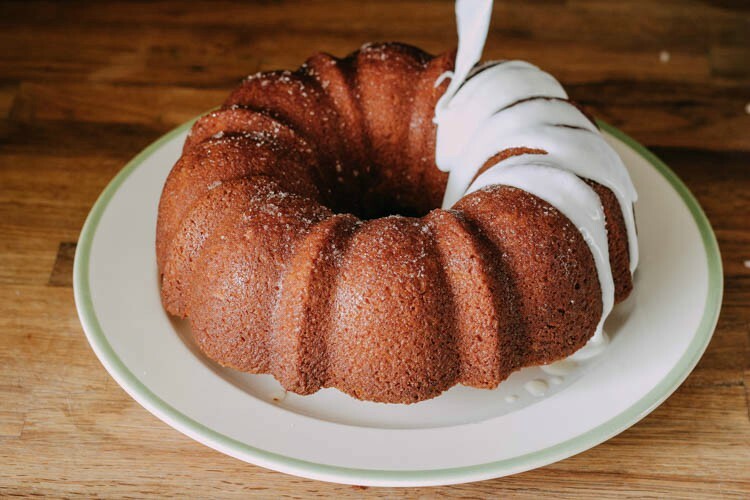 This bundt cake looks heavenly! May I have this for breakfast tomorrow? I love this so much! Looks so sweet and moist; perfect dessert on a warm spring evening! Thank you so much, Beth!! It is perfect for these warmer spring evenings! This is the perfect dessert my family will beg for more! I love lemon desserts! And this one looks really amazing!